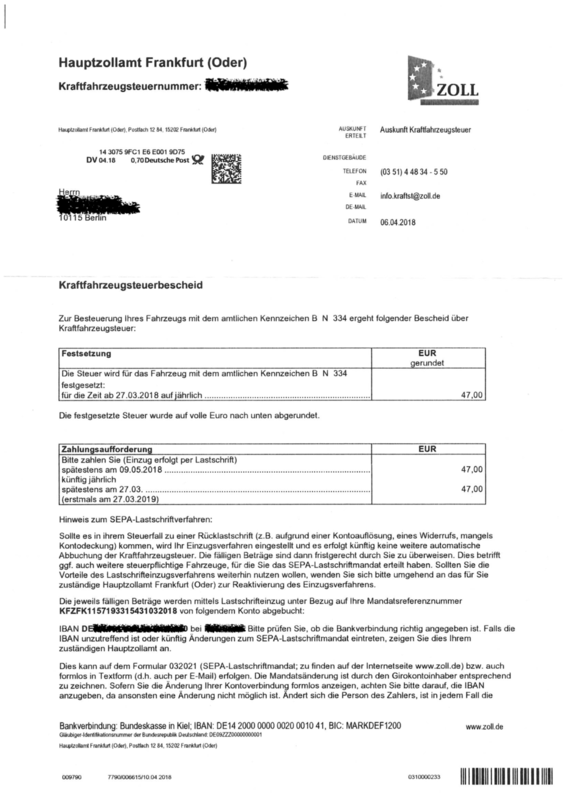 If you purchased a vehicle in Berlin recently, you will receive a letter from the Hauptzollamt Frankfurt am Oder asking you to send them money. Do not panic! This is the vehicle tax all Germans have to pay. 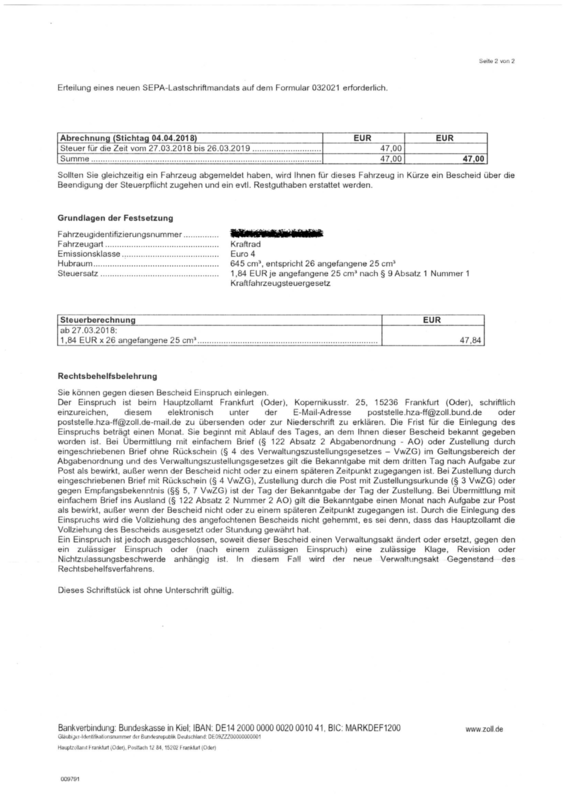 The letter comes from Frankfurt am Oder because the Berlin tax office has closed in 20141. As the letter says, you don't need to do anything. When you registered the vehicle, you authorised them to take the money from your account with a SEPA-Lastschriftmandat. The money will be taken from your bank account automatically in around 30 days. Verify that the IBAN on the first page is correct. If your bank details changed, contact the Hauptzollamt and inform them. Look for a transaction from "BUNDESKASSE IN KIEL". The description should be something like "Kfz-Steuer fuer [vehicle plate number] fuer die Zeit vom 27.03.2018 bis zum 26.03.2019 Kassenzeichen [vehicle serial number]"
Okay, so? I received also this letter. Do I have to pay the amount mentioned on it, or I can leave the notice alone? As the letter says (in cryptic bureaucratic German), they will try to automatically withdraw the money from your account. You gave them your bank details when you registered the vehicle. I will update the article with more details.